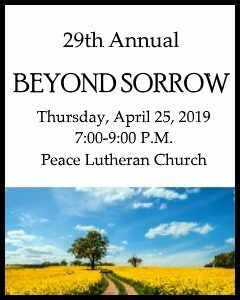 29th Annual Beyond Sorrow Seminar, featuring "Every Grieving Heart Matters," with guest speakers, Sarah Kroenke, LSW, FT and Cara Mearns-Thompson, MSW, FT. This event is sponsored by Dobratz-Hantge Funeral Chapel along with Hutchinson Health and Grief Share. CEU's are available for Healthcare Professionals.